The captain’s ‘pick’ for this year’s day away was at South Staffs GC in deepest Tettenhall near Wolverhampton. A free coach was laid on for about 23 players, which went down well with those who took up the offer. Most of the 63 members going last Friday had played the course before, but those who were new to it could not fail to be impressed by the generous fairways, challenging pin positions and general condition of the course. The format was set up to be as friendly as possible, being 2 from 4 to score, off the yellow tees, and with full handicaps applying. A random draw had been made beforehand, and worked quite well with each group enjoying the mix and ambition to score well on the day. 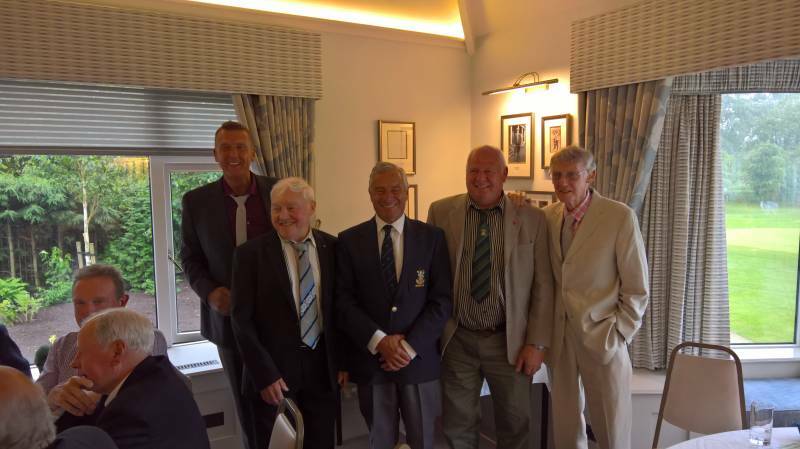 There was a brilliant mixture of golfers of all abilities, including an impressive list of 13 past captains and our esteemed professional. The captain enthused at the newcomers to this particular day out, but welcomed those who have been supportive over the years. The weather was kind for most of the groups, and rain threatened, but only the final few four balls succumbed to the damp conditions. After playing and enjoying their drinks on the patio, all the Leek group assembled for a superb meal and presentation. The captain would like to thank everyone for playing, and supporting the club in this manner. A lot of work goes into making this a success, but it would be nothing without members of Leek Golf Club supporting the captain on his special day.